Michele Klein Fedyshin, Research and Clinical Instruction Librarian, and Charlie Wessel, Head of Research Initiatives, were part of the team chosen as ABIM Choosing Wisely Champions for their work on the Improving Outcomes of UTI Management in Long-Term Care Project (IOU) by utilizing the Society’s Choosing Wisely recommendation #3: Don’t obtain a urine culture unless there are clear signs and symptoms that localize to the urinary tract. 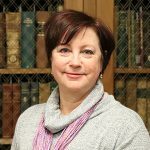 Helenmary Sheridan, Data Services Librarian, was accepted to the Medical Library Association’s Research Training Institute for Health Science Librarians. The week-long training program, held in July at MLA’s Chicago campus, will provide participants with instruction in research design and practice, individual mentorship, and a year of support to plan and execute original research projects. Helena VonVille has joined HSLS as a Research and Instruction Librarian and liaison to Public Health. She received her MLS from Rutgers University and her MPH from the University of Texas Health Sciences Center. Prior to joining HSLS, Helena served for 16 years as library director at the University of Texas School of Public Health where she also team-taught their Systematic Review, Meta-Analysis, and Evidence-Based Public Health course. For more information about Helena and her role as liaison to public health, please see “New Liaison, New Services“ in this issue. Natalie C. Ernecoff presented “Specialty vs. Primary Palliative Care in Randomized Clinical Trials: A Systematic Review” at the American Academy of Hospice and Palliative Medicine (AAHPM) Annual Assembly in Orlando, Florida, on March 15, 2019. Coauthors included Devon K. Check, Megan Bannon, Laura C. Hanson, J. Nicholas Dionne-Odom, Jennifer Corbelli, Michele Klein Fedyshin, Research and Clinical Instruction Librarian, et al. Katie Doong, Lucas Berenbrok, James Stevenson, Riley Uber, Jack Becker, and Michele Klein Fedyshin, Research and Clinical Instruction Librarian, published “Pharmacist-Led Pharmacogenomics Clinical Services in Outpatient Settings: A Systematic Review” in PROSPERO International Prospective Register of Systematic Reviews, 2019: CRD42019119746.